Quick summary: Students explore the plants in the school yard, focusing on leaf variation. They begin by creating a word cloud of terms relating to plants, and think about why we need plants. Students are then asked to observe a range of different plant materials (such as bark, twigs, seeds, etc.) and then focus specifically on leaves and the variety of leaf veins (venation). 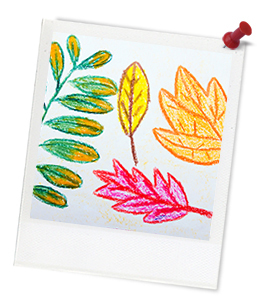 They will then participate in an observational drawing activity to represent a range of different types of leaves, and finally will share their favourite drawing with the class. Students understand that there are a great variety of plants and leaves. Students understand why plants are important. 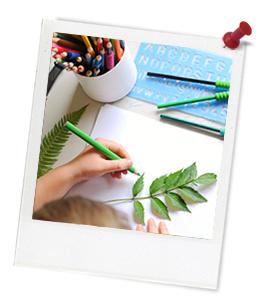 Students practise and develop observational drawing skills and are able to select the techniques that are best suited to different subjects. Resources required: Student Worksheets – one copy per student. Device capable of presenting a video to the class. Clipboards with paper and graphite pencils for each student. Coloured pencils or marker pens, such as Connector pens. Leaf Venation Factsheet. Colouring Techniques Handout. Parts of a Plant. Leaf Drawing Examples. Keywords: Plants, leaves, observational drawing, school yard. Students can name the parts of a plant. Students describe what leaf venation is. Students give a reason for why plants are important. Students use a range of colour pencil or pen drawing and colouring techniques. Students use the observation technique to draw a picture of a plant. Thought starter: Do you have a favourite plant? What was the best part of this lesson? What was hardest for me in this lesson? What did I do to overcome this challenge? What did I learn about plants by observing and drawing them?